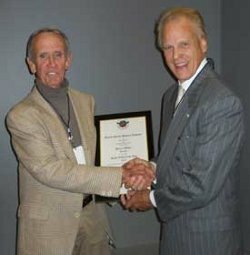 Harry Weber was presented with the 2011 American Sport Art Museum and Archives (ASAMA) Sport Artist of the Year, Sculptor, Award by United States Sports Academy Trustee Jack Scharr at the Foundry Art Centre in St. Charles, Mo. on Friday, 22 October. 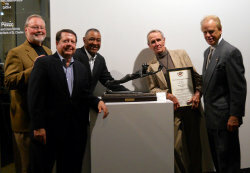 From left: Gary Shaw, President of the Foundry Arts Center; Greg Marasec, President of the St. Louis Sports Hall of Fame; Ozzie Smith, Hall of Fame Inductee and Former St. Louis Cardinals Major League Baseball Player; Harry Weber, 2011 Sport Artist of the Year, Sculptor; and Jack Scharr, Board of Trustees’ Chairman to ASAMA. Weber’s sculptures are in a permanent collection at the Baseball Hall of Fame in Cooperstown, N.Y. and are featured at the Museum of Fine Arts in Newport, R.I. Weber has won major awards at national juried competitions, and his bronze sculptures are in many private collections throughout the world.